BLANTYRE, Jul 21 2011 (IPS) - In light of the recent spate of protests in Malawi, government should rethink its policy to devalue the local currency, economists say. Economic and democratic governance concerns against President Bingu wa Mutharika’s government amid persistent fuel shortages ignited violent nationwide public protests on Wednesday as protestors called for Mutharika’s resignation. People looted shops and torched property in running battles with police across the country. Looting continued in some parts of Lilongwe and Blantyre on Thursday morning and security vehicles were seen patrolling the streets as the army had been called out to quell the violence. Over the past two years, Malawi has experienced sporadic fuel shortages. The fuel scarcity has been particularly persistent since January, resulting in long queues and motorists waiting overnight at filling stations for fuel. Commentators have blamed the shortage on government’s failure to contain the forex scarcity and not having enough forex with which to purchase fuel. On Jul. 20 Mutharika blamed the fuel problem and forex shortage partly on International Monetary Fund (IMF) policies. The IMF and local economic experts have also repeatedly called on government to devalue the Malawi kwacha to generate forex, but government has refused. “I cannot devalue the kwacha because no one, including the IMF, is giving me convincing arguments on what will be done to deal with the rise of the cost of living that will follow the devaluation,” Mutharika said. “That devaluation can cause inflation is true, but I would favour the inflation that comes about because of devaluation because there will be production. In the current scenario, inflation will be because of lack of commodities because we don’t have forex to produce which, in my view, is dangerous,” he said. Mutharika said because of IMF policies, government handed over the importation and distribution of fuel to the private sector. According to Mutharika, private fuel companies are more interested in maximising profits than ensuring a consistent supply of fuel. Government is in the process of establishing a national oil company that will take charge of purchasing fuel and has contracted an international firm to construct storage facilities that are expected to be ready within the next six months. Mutharika said the fuel shortage was because of the “tremendous economic developments” that Malawi is experiencing in construction, manufacturing and agriculture, which lead to high fuel consumption. Mutharika also denied that the forex shortage was because of government’s fixing the exchange rate. “At the insistence of the IMF, government is not managing forex. That is in the hands of the private sector and they stow it away in foreign banks,” he said. Mutharika announced that all forex will now be managed by the Reserve Bank. He also said all commercial banks in Malawi will be required to submit monthly reports on how much forex they handle to government. Chiputula supported government’s plan to regulate the flow of forex so that it does not leak onto the black market. In a public address on Thursday, Mutharika condemned the violence and invited demonstrators to a dialogue. “I would like to invite those demonstrating to meet me so we can discuss solutions to the problems the country is facing. Violence will affect development,” he said in a lunch-hour address. Civil society organisations under the Human Rights Consultative Committee also condemned the violence in a statement released Thursday and have called on the police to act. But there was no immediate commitment as to whether they will meet the president. “He (Mutharika) has made some misjudgments recently but it is the fuel crisis that has led to this explosion,” said a protestor in Blantyre, Malawi’s commercial city. 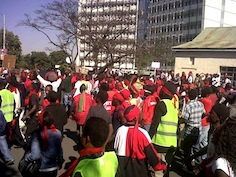 Ahead of the demonstrations, civil society organisations indicated that the march would be peaceful. However, groups of government sympathisers threatened to “meet protestors in the streets.” And on Tuesday, vehicles carrying panga-wielding youths who support Mutharika’s Democratic Progressive Party were seen in Blantyre. They threatened “to deal with” anyone demonstrating against government. On Tuesday, government approved the march but by evening some government sympathisers obtained a court order to stop the protest. The march organisers went to court to have the injunction overturned and on Wednesday morning tempers flared among the crowds that had gathered in Blantyre, Lilongwe and Mzuzu, in northern Malawi. There were riots in all the major cities, with the worst violence taking place in Lilongwe and in Mzuzu. Several vehicles belonging to Mutharika’s Democratic Progressive Party were torched and five people were reported dead. The protesters have asked government to address the acute forex and fuel shortages, corruption and improve on respect of rule of law, among other things. The protests come as Britain announced last week that it has suspended 35 million dollars worth of budget support to Malawi, raising fears of hardship for ordinary Malawians. Relations between the two nations have soured after Malawi expelled the British envoy after he allegedly accused Mutharika of becoming increasingly autocratic and failing on governance. Germany has also suspended part of its aid to Malawi. Meanwhile, this year government introduced a zero-deficit budget, where all recurrent expenditures are to be met by domestic revenue. The result has been the introduction of taxes on various basic commodities leading to a rise in prices. Political analyst at Mzuzu University, Noel Mbowela, said the protests have shown that Malawians appreciate that it is possible to turn things around even against a “repressive government”. He said this protest was a clear message to government to address the concerns raised. However, Mutharika also disputed that the country was badly run. “We have brought down inflation to single digits. We have enough to feed our people and sell outside the country. We were able to hold free and fair elections in 2009. We are making progress in fighting HIV/AIDS. These achievements, in my view, are not consistent with the so-called bad governance,” he said.